Ballz is a game available for both Apple and Android products. Already widespread and trending, Ballz has everyone glued to their phone screens, constantly trying to beat their high score. 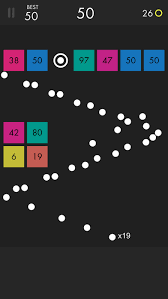 The point of the game is to shoot “ballz” at blocks, which have certain hit points indicating how many times the ball has to hit the block for it to break. If one of the blocks reaches the bottom of the screen, you lose. You can get another chance if you watch a quick ad, and once you watch it, you’ll be put back into the game and can resume from where you left off. While playing the game, you can earn coins and more balls to shoot during the game. Coins are represented by a greenish-yellow ring, and balls are represented as a white ring. The game never ends, as long as you never let a block reach the bottom of your screen, leading to continuous game play and hours of entertainment. Check out the game here on the Apple Store, or here on Google Play.